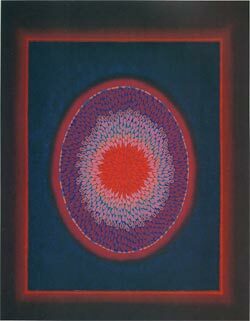 Leo Kenney: Amaranth, 1983, gouache on Chinese paper, 27 x 27 1/2 in. Note: click on images below to see a larger version. Leo Kenney (1925-2001) was an artist with a remarkable vision. Yet his work can now hardly be seen anywhere, even in the locales where he worked and was best known. Occasionally, it seems, an artist and the artist's art are born out of time and place. Sometimes the artist is ahead of his time; in other cases, the work, which might have gained notice and repute in another environment, comes too late or into the wrong scene and withers away in a desert of inattention. So it is with Leo Kenney, it seems. Had he appeared in Paris in the 1920s, or even New York in the 1940s, with the same ideas, his surrealistic and abstract phases might have found ready audiences among critics and collectors. As it is, outside of the Northwest, he seems largely forgotten -- a fate which deprives most of us of his work, given the present system of museums, galleries and book publishers, which seem to be strongly driven by pop, celebrity and grant-mongering, the days of épater les bourgeois far behind them. 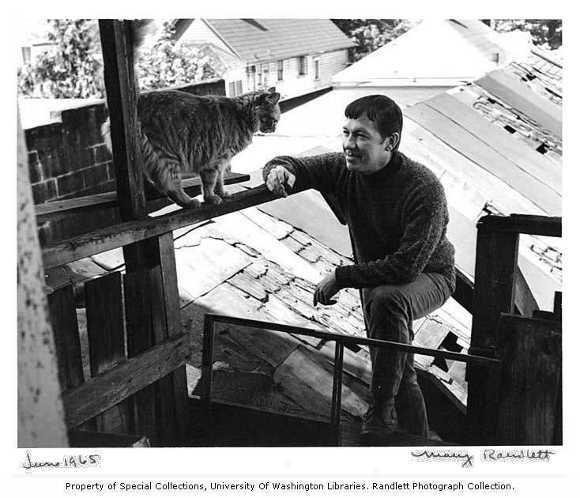 Kenney was self-taught; in a later era, he might have been promoted as an Outsider as in 'Outsider Art' even if he did not do time in jail or an asylum. However, his early work, although unschooled, bears a strong resemblance to the usual suspects of the Surrealist Movement of a generation before (though of course Dalí was still holding the torch and indeed flogging the remains of the movement into a popular personal style through the good agencies of the likes of LIFE; the relics of that effort can still be seen at certain malls.) But in the '40s and '50s Surrealism seemed to have been defeated by Abstract Expressionism; Pollock contested the pages of LIFE with Dalí and it was suggested that he was the greatest living artist. Rothko told someone he was creating the art of the next thousand years. The grand victorious counteroffensives of Pop Art and Conceptualism were a long time away. Out in the Northwest, however, which was then further away from the Big City than it is today, people must have been impressed with Kenney's work regardless of the fashions of the times, because one of his first known major efforts, at the age of 19, resulted in a sale -- to a respectable museum. People in Seattle hastened to link him to the 'Northwestern School'. At this time his palette was dark and highly restrained, which I am given to understand was customary in those regions in those days, perhaps in accord with its famed weather. Although he belonged to the generation which came of age during World War 2, he was too small (5'2") for military service, thus missing out on a possibly useful credential in the now bygone days of flannel-shirted artistic macho. Instead he labored in defense industries, working on his art at home in the evenings. 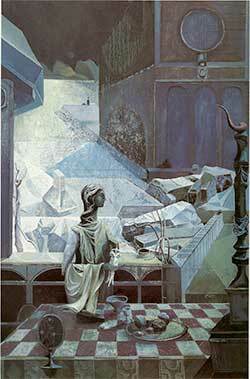 Leo Kenney: Northern Image / Muse III, 1948, oil on canvas, 29 5/8 x 29 1/2 in. Kenney's art went through distinct phases. He started out with complex, carefully constructed works in the Surrealist mode, in which we see distorted objects in unfamiliar surroundings, weeping masks and statues, bodies floating through dark seas, long Chiricoesque vistas, and so on -- a familiar collection of Surrealist paraphernalia. A particular characteristic of Kenney's from the beginning was the use of some forms reminiscent of Christian imagery, like chalices and fish, and of plantlike form. When he draws the human body, it is often immersed. One can carry on about these as symbolic references to Christianity, but others think, and I agree, that for Kenney the form itself was an idea in and of itself, and had spiritual valence as such. 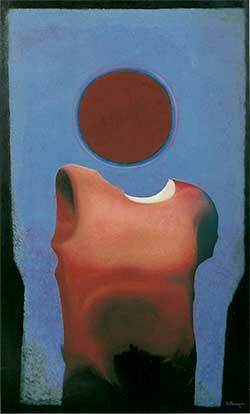 Leo Kenney: Relic of the Sun, 1961, oil on linen, 52 x 32 in. In any event, at a certain point in the early 1960s, Kenney turned rather suddenly toward simplification and abstraction and began to concern himself with glowing geometrical forms, especially but not exclusively circles. These were considerably at odds with his former work (although there are a few transitional forms) and to some extent with the Northwestern School of that time. 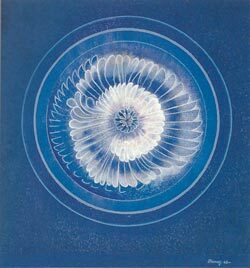 Leo Kenney: Feather-Waterbloom,1963,gouache on Chinese paper, 41 5/8 x 23 1/2 in. 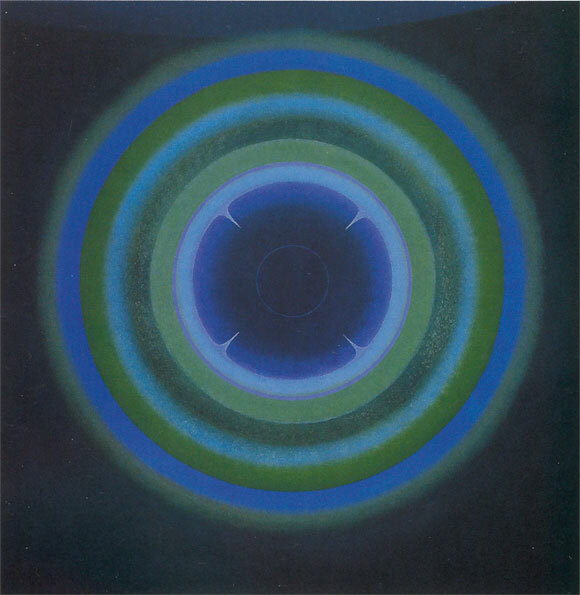 Supposedly, Kenney's interest in luminous circles was occasioned by an experiment with mescalin, but I have grave doubts about the efficacy of drugs in the enhancement of artistic practice, especially isolated experiences. He certainly did not go in for the flowing, supposedly drug-induced Art Nouveau of the period's hippies. Of course, circles are well known to shamanistic practice with or without drugs; they are thought to possess magical or at least hypnotic powers, and to represent the 'life, the universe, and everything'. Maybe circles were always circling Kenney. In any case he made a transition into the realm of mystical abstractionism, just as some other abstractionists had done before him. This is the part of his work which I find most remarkable. Leo Kenney: Seed and Beyond VI, 1969, gouache on Chinese paper, 17 3/4 x 21 3/4 in. In the glowing-circle phase, the form is developed in various directions, sometimes looking mechanical like a dynamo or a chart of planetary objects, at other times having a distinctly biotic style. 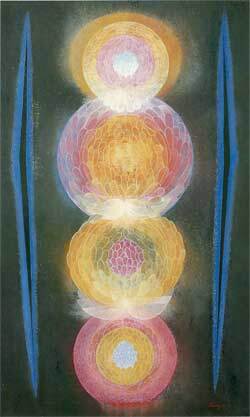 Yet others appear to be maps or flowcharts, or diagrams of the chakras. Almost invariably they vibrate with color. Leo Kenney: Petal, Wings, and Light, 23 x 34 in. 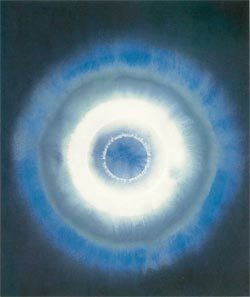 Leo Kenney: A Breath of Light, 1968, gouache on Chinese paper, 20 1/8 x 17 1/8 in. Leo Kenney: Two Part Invention, 1983, gouache on Chinese paper, 37 1/4 x 29 1/2 in. 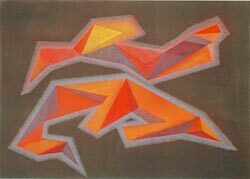 Later, apparently feeling that the circle form was too restrictive and perhaps too static, he made a series of assymetrical paintings composed mostly of linked parallelograms. These, to my mind, are generally less powerful than the circle-focused works. If it was the result of calculation, it wouldn't be the first time the movements of the spirit were 'sicklied o'er with the pale cast of thought.' But (one is replicated here) you may find them more interesting. The title of the one illustrated, 'Two Part Invention', refers to the compositions of that name by J. S. Bach, of whose work Kenney was an ardent fan, often playing recordings of it while he painted. (Compare Feininger, another geometrist, another rather neglected genius, whose admiration for Bach extended to fugal compositions.) Another escape from the circle was its partial dissolution into the mentioned biota: seeds, leaves, petals, organismic form in general. Partly because of the labor which his work required -- however abstract and mystical, it continued to be meticulously detailed -- and partly due to health problems, Kenney's production slowed down significantly in the 1980s and '90s. Without new work, there were no shows for collectors and fans to attend and nothing for critics to write about. And so he never went over into the big time. Indeed, thirty years later, and more than a decade after his death in 2001, he appeared to me only as a used book, the catalog of a 2000 retrospective in La Conner, Washington, waiting hopefully to catch my eye in the one-dollar box at Strand; from its pages, just about everything in this article is taken. It's a good book, containing, apparently, a substantial portion of Kenney's work, and can still be obtained via Amazon and other booksellers. There are also some other images out on the Net here and there. Might he be rediscovered? All artwork images reproduced on this page are under copyright of the artist or assignee unless otherwise noted.